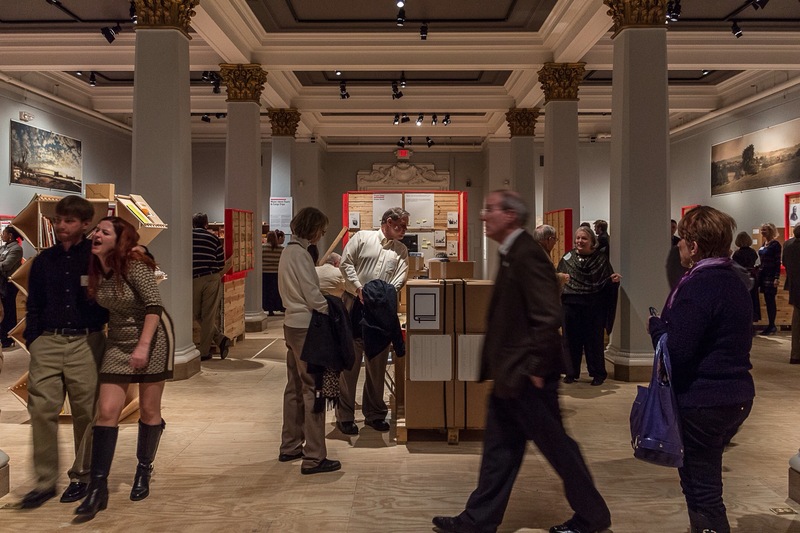 Utopia reached its final destination of the Missouri History Museum in St. Louis Missouri where it opened on November 22, 2014. The 40 foot container was opened, its 30 crates unloaded, then opened at its’ final home in the Museum’s Piper and Lammert galleries at 5700 Lindell Avenue in historic Forest Park. Your journey begins with an open crate, and maps unfurled to explain Germany’s political conditions in the early 1800s. The student goals and uprisings after the Napoleonic wars provide a better understanding of the reasons for the massive emigration that began with Gottfried Duden’s Report on a Journey to the Western States of North America first published in 1829. Two former students of the University of Giessen, best friends Paul Follenius and Friedrich Muench have studied Duden, yet are determined to make their move to the U.S. a large political statement. After publishing their Call and Declaration on the subject of mass emigration from Germany to the North American free States they find thousands wanting to join them. Labeled traitors by some, they lay plans, and select their first five hundred members from all walks of life, and religions in Germany. With hopes that more will follow, their goal is to establish a center for all Germans in Arkansas Territory, from Germany and across the U.S., they hope to establish a German State when they reach the necessary 60,000 signatures. Their journeys are examples of the terrible conditions early 19th Century emigrants often encountered. Follenius and over 250 companions on his ship the Olbers encounter deadly disease and reportedly lost over 70 members. When Muench later arrives at Bremen, to be joined by his additional 250 members, he learns that the destination has been changed by Follenius to St. Louis, and there is no sign of the ship that has been chartered for their group. (The port had not reached the status it did in coming years.) After several horrible weeks on Harriersand Island, the group departs for the U.S. and heads to Missouri. Early 19th century German emigrants to Missouri encountered small primitive farms, or large slave owning plantation farmers, in a brand new state (1821) only recently added to the U.S. with the Louisiana Purchase (1804). The Far West was ideal for the freedom loving immigrants, who wrote their own letters home about the conditions. Recently arrived emigrants stated that while all things were not as Duden described, in some ways they were actually better. Between 1834 and 1837 over 30,000 Germans emigrated to Missouri, with at least 7,000 of those settling in St. Louis. While the Society’s original goal was an impossibility and never attained, Missouri became a State that enjoys a rich German heritage to this day. The exhibit continues with the music and voices of those who were members of the Giessen Emigration Society, while sharing the story and struggles all immigrants encounter even today. Created to travel, just as those original emigrants did, the unique appearance of the exhibit strikes many upon entering. After studying the story as it is told chronologically (follow the orange arrows on the plywood floor) through its various video installations, films, murals, and stations, one arrives at its archives and library. For those who still want more, they are offered an opportunity to research the thousands of documents or various books used by the exhibit’s creators. Or, they can continue their journey into the future by booking an object for permanent relocation to Germany at the Muss i denn desk, and make a personal connection as well. The exhibit will be at the Missouri History Museum until April 19, 2015 providing the country with a virtual journey through time where they are invited to discover their own meaning of Utopia. On a weekday in December there were visitors from Milwaukee to California, and Florida to New York, and other countries as well. The Muss i denn desk is manned on Saturdays for those families that would like to establish a connection with those of their ancestors. On Tuesday mornings at 10:30 am, curator Dorris Keeven-Franke, a member of the Traveling Summer Republic team that created the exhibit provides tours that want that even more in-depth experience.